Most of us are familiar with using the minor and major pentatonic scales in our blues solos. But in major blues, there's a seven-tone (heptatonic) scale, Mixolydian, that can offer us more colourful, sweeter phrasing options. Mixolydian is a great scale to experiment with in a major blues context. It'll give your blues licks a jazzier, richer melodic voice around those dominant 7th chords. The idea is to use it in combination with the more staple pentatonic scales. Mixolydian works in blues because it includes all the tones that make up a dominant seventh chord (and its natural extensions) - the chord type used in most major/dominant blues progressions (e.g. A7, D7, E7). So we have the 1, 3, 5 and ♭7 intervals that make up a dominant seventh chord, making Mixolydian a natural dominant scale. Why am I telling you this? 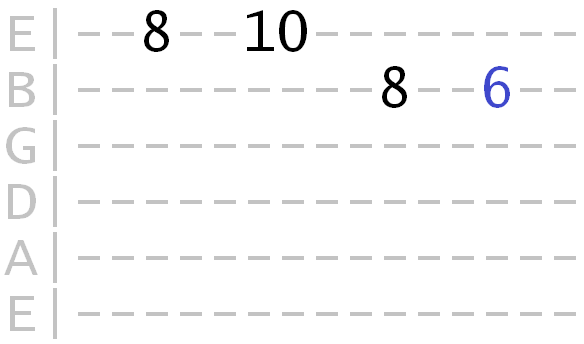 Because these will be our strongest target notes for our phrases and licks, as they connect directly to the backing chords. The other scale intervals - the 2, 4 and 6 - can be thought of as "colour tones" that we'll use to flesh out our phrases, like "connect the dots". Think of using the tones in this way and you'll never get lost when improvising! As there are three chords in a standard blues progression (sometimes referred to as 1, 4, 5), we'll need a different Mixolydian pattern for each chord. 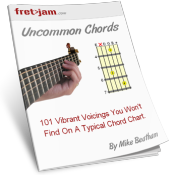 Unlike scales such as minor pentatonic, a single Mixolydian scale won't cover all the chords. But it's not as challenging as it sounds! Use the 1 chord pattern as the reference for the key you're playing in. 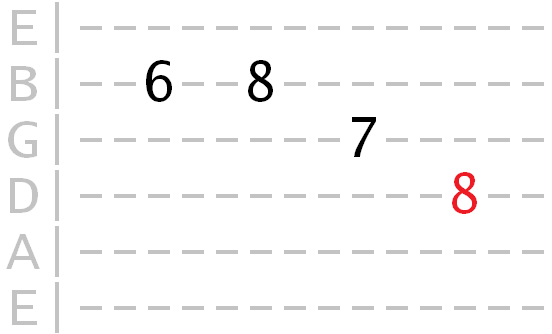 So if you're in the key of A, position the 1 of the 1 chord pattern on A (5th fret). If you're playing in C, position the 1 of the 1 chord pattern on... C.
Once you establish that 1 chord position, the 4 and 5 chord patterns can be made to fall into the same position. 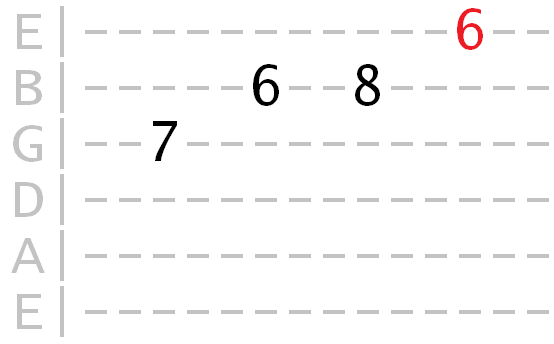 Use the tabs below to switch between the 1, 4 and 5 chord Mixolydian patterns. Tip: Practice any phrases/licks you come up with in BOTH positions. As covered in the video, it's good to know where these strong, dominant 7th chord tones exist within the Mixolydian pattern. This is so you can confidently target those tones in your phrases and also use them as arpeggios to provide the "skeleton" for your phrases (examples later). Start by playing just the chord tones over each chord, either one per chord or arpeggiating each chord. This will get you used to targeting these tones as the chord changes, keeping your melody connected to the backing music. Build simple three/four note phrases over each chord that land on one of the chord tones. Think of it like "connect the dots", the "dots" being the chord tones! Try using three/four note arpeggios as "lead-ins" to your phrases, or to break up your phrases, essentially outlining the chord within the phrase. Practice linking phrases together through the chord changes. 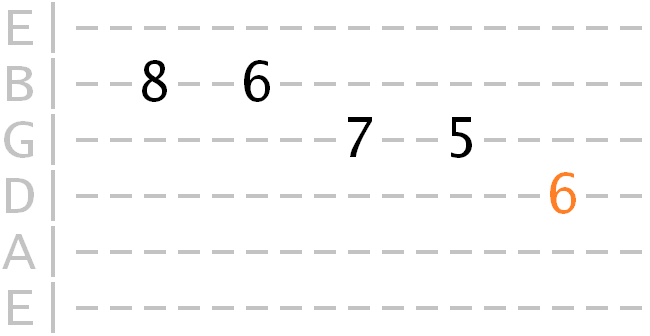 Again, the chord tone positions will help you move into place for the current chord. Gradually add in techniques such as bends, slides, hammer-ons and pull-offs to really squeeze the colour and emotion out of the scale. We'll focus on these techniques in a separate lesson. 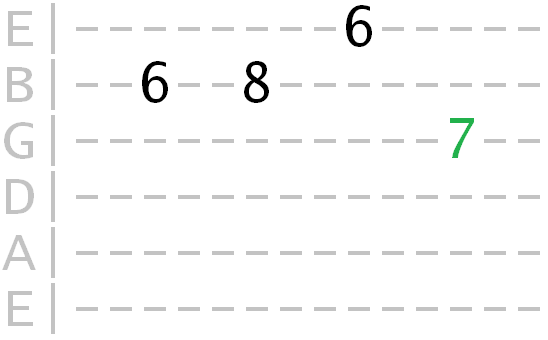 Practice targeting chord tones (the 1, 3, 5 and b7) within the scale pattern. Build simple phrases that resolve to each of these target notes. Here I've selected some quality blues backing tracks, courtesy of Cliff Smith, to make your practice more fun and engaging. Each track follows the standard 12 bar blues formula. Time for a cold one, I think! Thank you for your time and patience. Hopefully, you'll have plenty to play with for weeks, months and years to come. Blues really is a great style of music to develop your soloing skills, because it's relatively simple in form. With Mixolydian under your fingers, you'll be able to create those sweet, spine tingling solos that express what no words ever can, and that's what music is truly about. Live, breathe and enjoy it! You can learn more about using scales in blues effectively here.